and last but not least, a tulip poplar pulls a new leaf out of its hat in a long-running magic trick. With the spotting of a "teenage" black bear in Princeton yesterday, it's time to brush up on bear facts. Princeton township has useful info from the NJ Dept. of Environmental Protection on how to behave if you encounter a black bear. For anyone heading out west into grizzly country this summer, it's good to know that the appropriate response to a black bear is completely different from what to do when happening upon a grizzly. A photo of the bear and more information on its stroll through town can be found at Planet Princeton. I doubt it expected to go from a life of anonymity to celebrity status in a day, with a crowd gathering to watch it over at the Princeton Cemetery while news helicopters hovered overhead. A photo of the offspring of the Mercer Oak at the Princeton Battlefield would be appropriate for Memorial Day, but lacking that, a post on bamboo will have to do. My understanding is that the Revolutionary War was a war of attrition. The Continental army won few battles, but managed to sap the will of the British over the course of eight years. You may never completely win the battle against bamboo, but conducting a war of attrition can turn an advancing monster into a minor nuisance. The goal is to starve the massive root system of energy, in other words, to lay siege. Cutting down all the stems immediately shuts down any solar energy collection, forcing the root system to use its reserves to sustain normal metabolism. The roots then commit additional energy reserves to sending up new shoots. These can reach six or more feet before they start sprouting leaves. As these bare stems grow, be patient. Keep those loppers at the ready, then cut the long, still-soft stems down just as those solar collecting leaves begin to appear. Proper timing will cheat the roots of any return on a substantial investment in new infrastructure. As the roots weaken, each new set of sprouts will be smaller than the last. For battles waged on the property line, an alliance with the neighbor will be critical. Mock strawberries look like native, edible strawberries, but their flowers are yellow and the berries are inedible. It spreads through flower beds and lawns by sending long runners across the ground, sprouting new plants along the way. Catching it early can save a lot of time later on. The photo shows how one plant sending out three runners has already formed 18 new plants, and it's still early in the season. Each new plant can form roots that will make pulling much harder later in the season. The native wild strawberry can also be aggressive, quickly spreading through the garden without providing much in the way of berries. the apple looks like this. the berry looks like this. And when they gang up on the blueberries, my harvest will look like this. All sorts of irises are blooming in gardens around town, but this post is about native irises found on wet ground. a more subtle iris blooms in out of the way places where the ground stays wet enough. It looks like a rosette of grass about a foot high, but with tiny flowers at the end. Blue-eyed grass has the scientific name Sisyrinchium (accent is on the "rink" in the middle of the word). Learning to say the name can be as pleasurable as discovering a tiny blue flower at the end of what looks like a blade of grass. A closer look reveals that the stem is flat like an iris leaf. I've long been content to stick with the genus name, but after consulting with Newcomb's Wildflower Guide, I'd say this one's Stout Blue-Eyed Grass (S. angustifolium), because the stem is branched. then chances are good you're walking beneath a honey locust or two. Gleditsia triancanthus, as it is affectionately known among those with an inexplicable memory for latin, can be found occasionally in the wild, where it is typically armored with big thorns to ward off the now non-existent North American mega-fauna. The thorns can supposedly be used for nails. A thornless variety is common along streets, such as at the township hall parking lot. In fall, the small leaflets drop onto the lawn, nestle between the grass blades and disappear without need of any raking. Compared to the amount of preserved woodlands, Princeton is lacking in open field habitat for wildlife. Walk through a typical woods in summer, and you'll find almost nothing blooming. How are pollinators to survive? One victory came when the DR Canal State Park agreed years back to sharply reduce mowing in fields near the towpath between Alexander and Washington Roads. After years of ongoing decapitation, wildflowers were finally able to grow to maturity, providing cover and a progression of blooms all summer. Retention basins, such as this giant one at Elm Court, can also be converted to excellent habitat. Mowing is done annually rather than every week or two, saving money, effort, and any risk associated with mowing those steep slopes. This is just one of many such basins around town, designed to catch runoff from nearby buildings and parking lots. Their periodic inundation would be beneficial to the many kinds of native floodplain wildflowers available. In this photo, you can see the "sidewalk to nowhere", a puzzling design feature that, last I heard, has been shown to be unnecessary. Smoyer Park, out Snowden Lane on the northeast side of Princeton, has some fine prospects for reduced mowing. These basins are useless for recreation and may as well become habitat. A federal program, called Partners for Fish and Wildlife, has already funded the successful conversion of a similar basin at Farmview Fields on the west side of town. They replace the exotic turfgrass with "warm-season" native grasses (Indian grass and big bluestem). The best thing about a sidewalk to nowhere is that it will eventually break up and make room for plants to grow. Retention basins vary a great deal in how wet they remain inbetween rains. Some receive seepage from underground, which helps keep the ground wet and allows a greater variety of plant species to survive. Where there's good moisture, you can see small rushes and sedges already growing (dark clumps in photo), despite the frequent mowing. One basin that has particularly great potential is just down from the office complex on Ewing Street. With the Princeton Charter School next door, it would make a great educational asset for the school if planted with native floodplain species. My efforts to interest the out-of-state owner in substituting habitat for turf were unsuccessful, but it was worth a try. A couple years ago, it seems that someone came through the neighborhood telling homeowners they had dangerous trees that needed to be pruned or taken down. One neighbor, apparently moved by fear or the low price, had a silver maple trimmed back to the trunk. The tree had a couple sprouts on its trunk last year, but otherwise no sign of rebound. The best one could say, on its behalf, is that it is storing some carbon, and may prove a good host for woodpecker food. Perhaps its slender shadow could be used to tell time. Severe pruning is practiced in Europe, particularly along narrow city streets where trees need to be kept small, but obviously there's an art to it, and I have yet to meet a trained American arborist who would say anything good about the approach. One highly fortuitous place to find yourself at 7pm tonight (Tuesday) is in the Princeton Public Library Community Room, where Jim and Carol Grant Gould will be giving a presentation on animal navigation. An article by Linda Arntzenius in the current U.S.1 publication provides an excellent introduction to this local couple's life and work. There, on that tree across the lake, past the national women's rowing team training for the Olympics. Can't you see them? Okay, maybe a different camera will work better. Thanks to Pam Machold for sending me these. 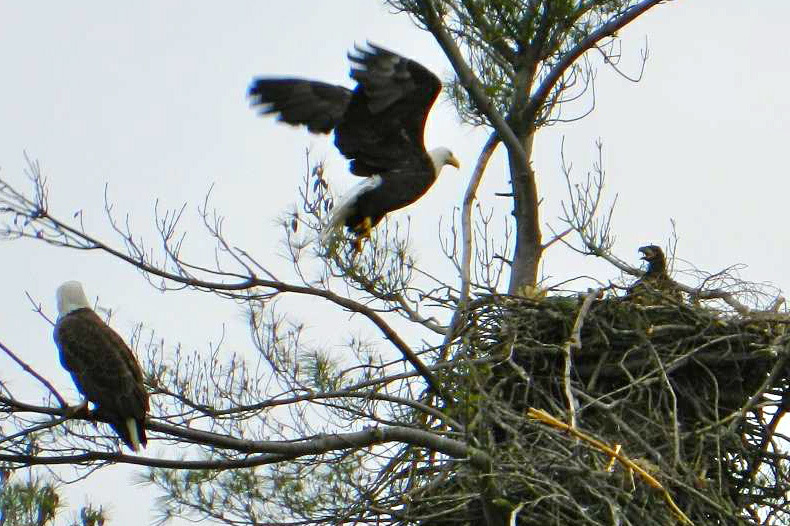 Here's Mommy and Daddy Eagle, and Baby Eagle, feeling like they're on top of the world, or at least on top of the local foodchain. and a shot of parents in action. I happened to be at this remarkable home, perched on the edge of Carnegie Lake, for a New Jersey Conservation Foundation gathering. When Emile DeVito, NJCF Manager of Science and Stewardship, speaks, even the owls listen up. 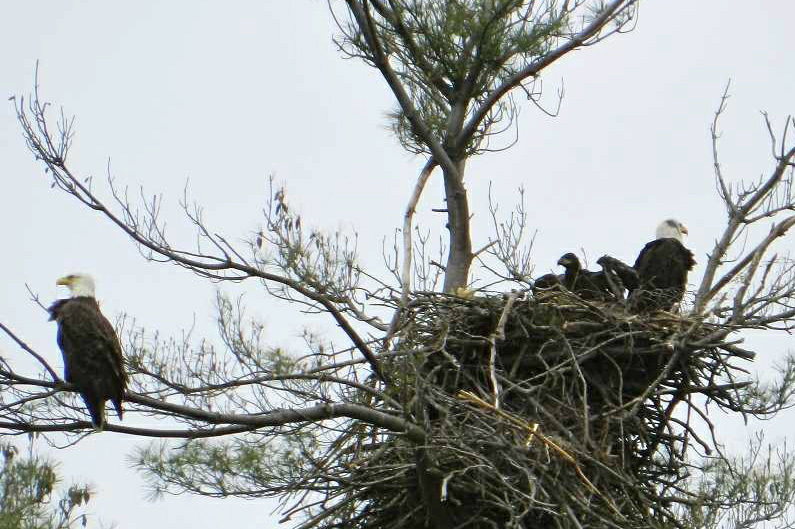 Emile remembered visiting the one remaining bald eagle nest in New Jersey back in 1973. 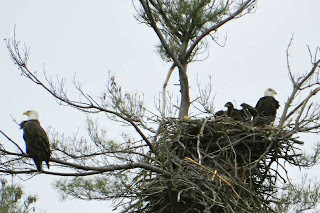 Since then, through considerable human intervention to nurture fragile eggs, and the banning of harmful pesticides, the bald eagle population has grown to 100 nesting pairs. Emile explained that, early on, biologists would take the thin-shelled eggs from the nests, replace them with artificial eggs to fool the eagles, then hatched the eggs in the laboratory and returned the hatchlings to the nests for the eagles to raise. As DDT faded from the foodchain, the eggs must have grown stronger, because the eagles have now repopulated NJ to the point that the best nesting sites are taken. 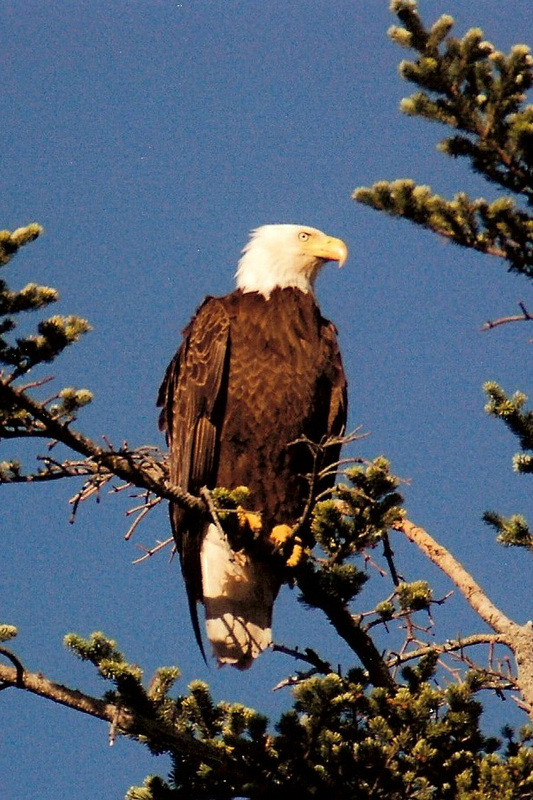 Though the recovery of the bald eagle is a great success story, it is not possible to intervene in a similar way to save the thousands of species of plant, bird and insect species that are threatened. He said that a third of plant species in New Jersey are now threatened, due to habitat degradation. Only the preservation and stewardship of habitat can preserve the many species pushed to the edge. Every homeowner has to deal with drainage, which could be considered dull if it didn't stir considerable passions in people, particularly those on the receiving end of someone else's runoff. The traditional approach has been to either ignore runoff until it causes trouble, or to get rid of it as quickly as possible, typically through buried pipes. My approach is to make runoff the central driver in landscaping decisions, to treat it as an asset while keeping it away from the house, and to take as much advantage of it as possible before it leaves the property. One dilemma in our yard has been that much of the rainwater from the roof was directed into the driveway via underground pipes. From there, it was expected to flow away through a small drainage pipe that has never worked very well. The drain has become so slow, and unrotorootable, that the driveway now behaves like a retention basin. Not a bad use for a driveway, in some respects, but not ideal. Part of the solution has been to reroute runoff into the front and back yards, away from the driveway. The most recent rerouting takes runoff from the front portion of the roof under a walkway and out towards the street. Given how little fun it is to dig under a walkway, this project was mulled over for many months. Sure enough, digging a ditch has not gotten any easier since the last time. It's always good to have a spot picked out for the extra dirt, which in this case fortified the Maginot Berm that diverts runoff from my uphill neighbor's driveway away from our house and into another raingarden in the front yard. One less than optimal aspect, not considered until after the fact, was that quite a few tree roots got cut in the process. A lawn's monocrop appearance gives no clue to the web of tree roots just below the surface. Hopefully the trees will end up benefitting from the extra water coming their way. Chunks of sod got flipped upside down and put back in the ditch, then buried with loose dirt. Tubing had been previously obtained from the neighborhood curbside kmart before it could head to the landfill. Some leaf compost from the Lawrenceville Ecological Center probably wasn't necessary, but a little doesn't hurt. Many native plants do fine in poor soil, and since this raingarden overflows across the sidewalk and into the street, it's best to minimize nutrients. Here it is in action, holding water that will seep into the ground over the next day. Plants include soft rush, turtlehead, monkey flower, a Carex sedge, and a few other plants thinned from backyard gardens. The D and R Greenway is having its spring native plant sale today, Friday, 3-6pm, and Saturday 1-4pm. More info at http://drgreenway.org/PlantSales.html. They usually grow their plants from local genotypes, meaning from seed collected from naturally occurring local populations. Given that a species can vary genetically across its range, buying local genotypes can help preserve what is special about the local version of the species. leaves with lots of leaflets, and gobs of white flowers this time of year, chances are it's a black locust (Robinia pseudoacacia). It's also called yellow locust because its inner wood is distinctively yellow. Though native more specifically to the Appalachian Mountains, black locust is common here in town. The wood's resistance to decay made it popular for use as fence posts, and it makes great firewood, burning hot and clean. A particularly statuesque specimen can be found in Princeton on Hamilton Ave. near Harrison St, with four trunks cabled together. A fly-by-night tree cutter tried to convince the owner to cut it down, but fortunately the owner wasn't swayed. My first encounter with black locust was in Ann Arbor, MI, at the home of Dr. Duff, who studied the effects of radiation on survivors of the nuclear bombs dropped on Hiroshima and Nagasaki in World War 2. His home was filled with Japanese art, and a bamboo fountain decorated the garden. The grove of black locust fit right in as a backdrop, their dark, gnarled limbs contrasting with light green leaves. "Hey, why not? ", the statue seems to ask, from his accustomed vantage point in front of a fig tree. Why not let chives turn sunlight, soil and air into flowers to greet the passersby? Why not plant peonies, strawberries and cabbage, and let the thick mulch do the weeding? Why not grow food where an ordinary, static lawn might ordinarily be. This frontyard garden is actually part of a dietary movement led by Dorothy Mullen and written about this past week in a US 1 article. Her website is thesuppersprograms.org. Dorothy is also gardener in residence at Riverside Elementary, where the extensive school gardens have become incorporated into the curriculum. lest you brush against poison ivy that's been allowed to grow out over the pavement, for several summers now. Elsewhere along this neglected sidewalk on a much-traveled street, the plant growing in your path might just be a box elder tree, which has leaves much like poison ivy, but less shiny, and has opposite branching instead of alternate, and is a tree rather than a vine. Or it could be Virginia creeper, which has five leaflets per leaf instead of three. And for the old guy who rides the little electric cart around town, now pulling a little wagon he uses to collect trash along the way, well, he'll have to cross the street if he wants to ride on a sidewalk kept clear of english ivy. and a black locust seedling. Typically, neglected sidewalks are on the back side of properties, where the owners seldom go. But even front sidewalks can get overgrown and put the squeeze on pedestrians. What can be useful and even rewarding to cultivate is a sense of stewardship and pride in that small piece of public right of way--sidewalk and curb--each homeowner is entrusted with.